This is a special money saving deal that includes both the Emjoi Light Caress epilator and the Kalo Post Epilating Spray. The Emjoi Light Caress has a new bright illuminating light for the hard to see hair, the Emjoi Light Caress features 36 patented 24karat gold plated hypoallergenic tweezer discs that remove hair quickly and efficiently. The Pain Reduction technology coupled with a massaging finger attachment (included), greatly reduces discomfort. The new ergonomically designed soft grip feature commands control when removing hair from the legs, arms, underarms, bikini line and even individual facial hair. It will even remove hair from the root as short as 0.5mm resulting in skin that is smooth and silky. Kalo Spray is ideal for treating larger areas like legs or the back. Kalo is applied after the hair has been removed by the root. 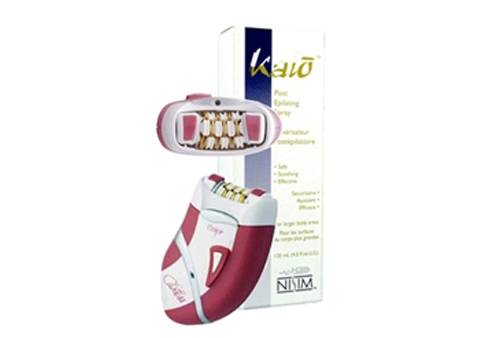 Kalo should be applied 3 times the day of hair removal and 3 times the next day. Kalo will prevent about 10% of the hair from growing back each time it is used after the hair has been removed by the root. You should notice results after about 2-3 hair removal sessions. Most people will require about 10-15 sessions to completely rid the hair.